gallamore west: #1 Dad Father's Day Gift Idea: HOW TO style a themed gift display!! #1 Dad Father's Day Gift Idea: HOW TO style a themed gift display!! Father's Day is coming up soon, so it's time to start thinking of something fun that the Dads in your life will love! Every year I come up with a creative theme to decorate our sun room for Father's Day, and this year it's #1 DAD. It's super fun and EASY to come up with a theme for Father's Day and I'm going to show you how today! Whenever my hutch decorations are centered around a holiday or someone's birthday, I usually style the decorations based on the gift that I buy. For Father's Day this year, I found this Armor All Car Care Gift Pack for my husband. 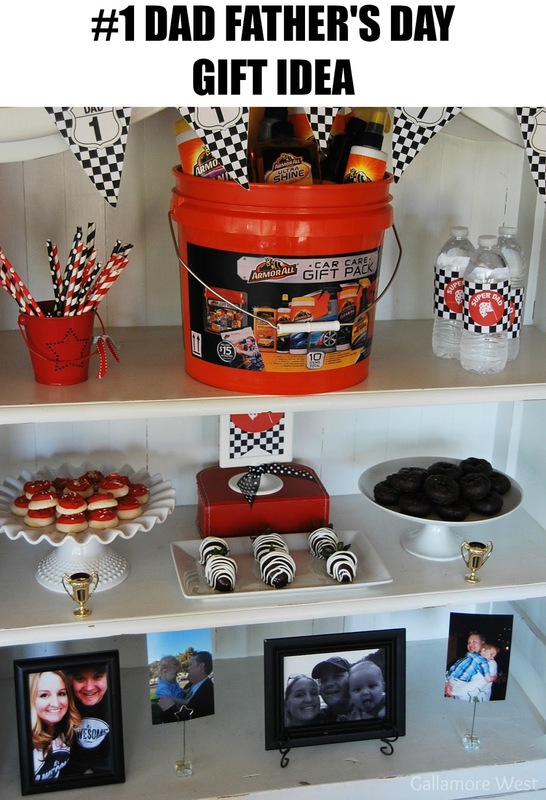 It's packed full of Armor All Car Care items, so I thought a #1 Race Car theme would work great for the hutch decorations. 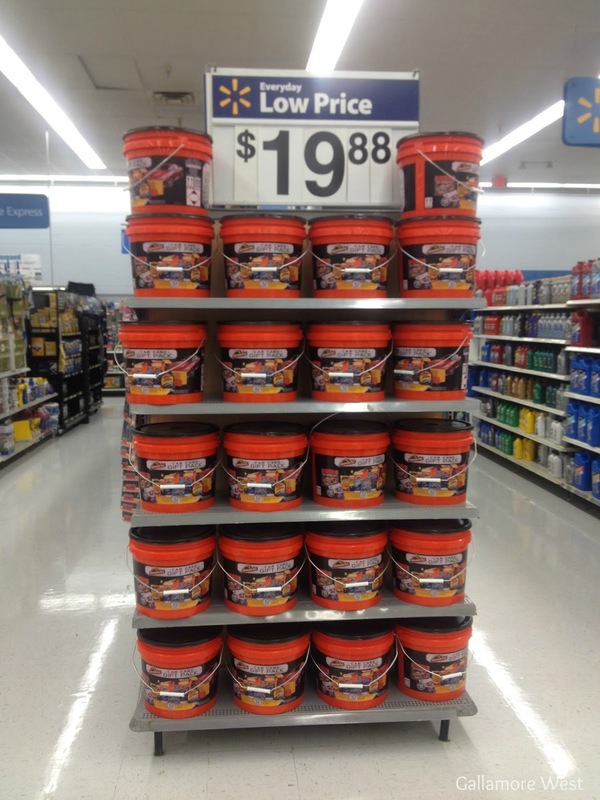 The Armor All Car Care Gift Pack is from Walmart, and it's the perfect gift for Father's Day because dads are always driving around and their car needs some TLC. Armor All products help people protect and preserve the appearance of their car, and that's something that Dads love. The Armor All Car Care Gift Pack is a great deal too because separately these items would cost you over $30, plus here's a $2 off coupon for you too, while supplies last. 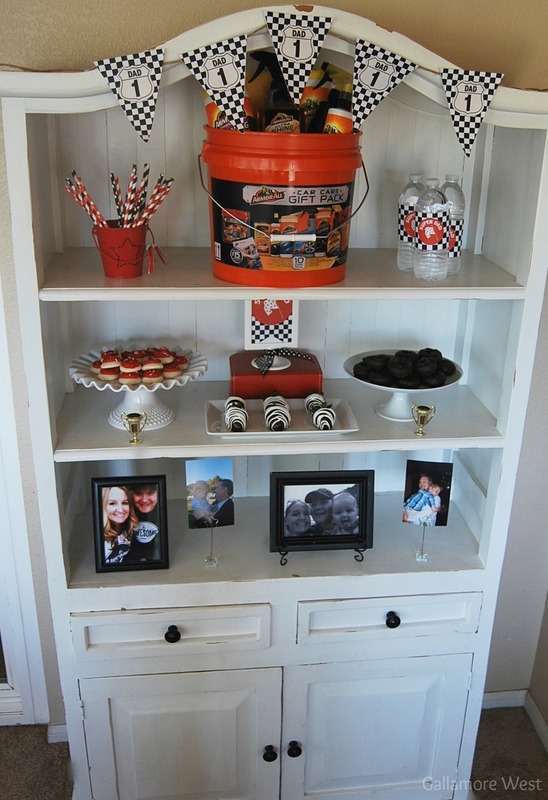 I used the Armor All Car Care Gift Pack for the centerpiece in decorating the whole hutch! 2) Choose or make some printable items to tie everything together. 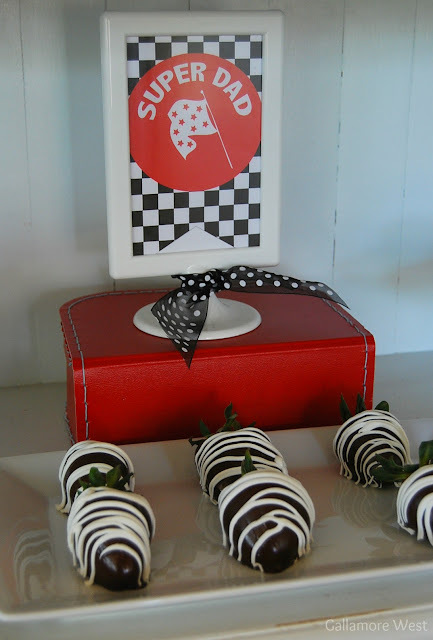 For this display I just found some FREE race car printables on Pinterest. They're from Creative Little Stars, and she has THE cutest shop full of printables! 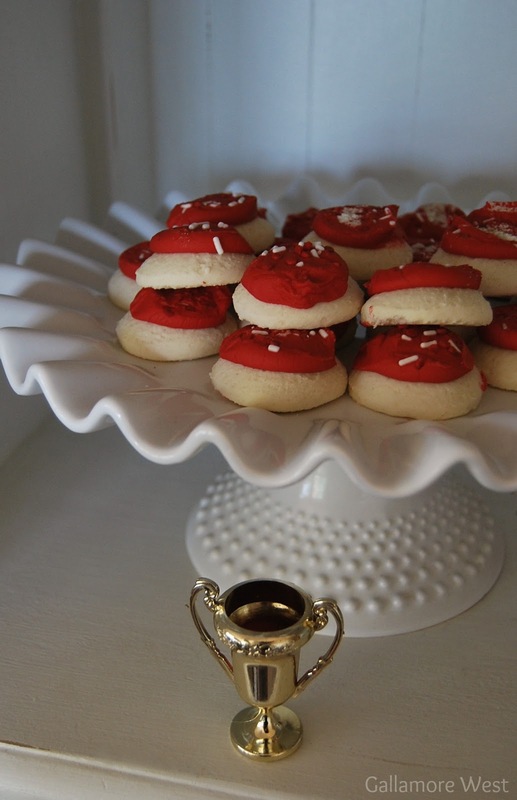 3) Stick with basic colors and buy/make easy desserts matching your colors. It's easier than you may think to set up a fun theme gift and display for Father's Day (or ANY occasion really!) I am ALWAYS switching out my white hutch decorations for parties and holidays. I rarely spend any money doing it too because I just look around our home for things that work into the decor. I stuck with black, white, and red for my color scheme for this Father's Day set up so I just used white cake plates and platters, red boxes and buckets, and I found simple, delicious, ready to go treats from the bakery at Walmart to finish off the display (mini red hot cookies and mini chocolate donuts). I dipped the strawberries in chocolate and drizzled with white chocolate to carry out the black and white theme. 4) Add a special, memorable touch! 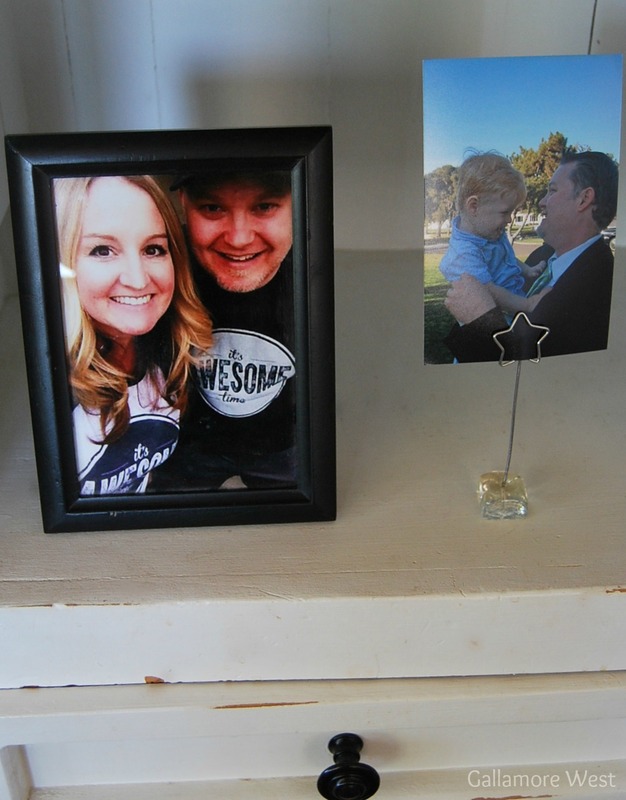 To personalize the whole display, I pulled out some sweet pictures of my husband with the boys and I. He's such an awesome, loving Dad. The boys and I adore him. He works so hard for our family and comes home every night and helps me with our boys. He is my #1 supporter and he believes in me even when I doubt myself. I'm so grateful for this man. He is definitely our #1 DAD and we wish him and all dads a HAPPY FATHER'S DAY! 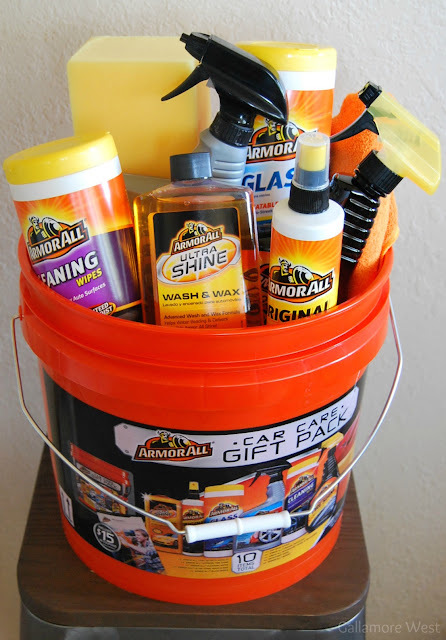 Want to pick up an Armor All Car Care Gift Pack for the #1 DAD in your life? It's on an end cap at Walmart... don't forget your coupon, available while supplies last. Want to see other hutch themes I've styled? Here's my hutch for Easter, Big Hero 6 Movie Party, Basketball Party, Breakfast Cereal Party, and a Harry Potter Party!